Edward Douglas Forman to Mae Kaiser, postcard, August 17, 1918, Collection of Postcards from Edward D. Forman, Digital Library, Villanova University, http://digital.library.villanova.edu/Item/vudl:334241. In April 1918, the United States formally entered World War I, joining the nations of Europe in their struggle against the Axis powers. Young men and women rushed to answer the call to serve their nation, as the government prepared to send them overseas to fight and serve as nurses. For those being sent to the front, and for their loved ones staying at home, the separation imposed upon the soldiers and nurses and their friends and family was surely daunting. To help cope with the separation and the anxiety produced by war, letters exchanged between those on the front lines and those at home provided assurance and a sense of normalcy during the war, while after the war, these same letters embodied wartime memories. Nevertheless, not all soldiers were as stoic as Dicello. In a letter to his mother dated January 30, 1919, Charles Stanley Lamb apologized for having distressed her in a former letter. 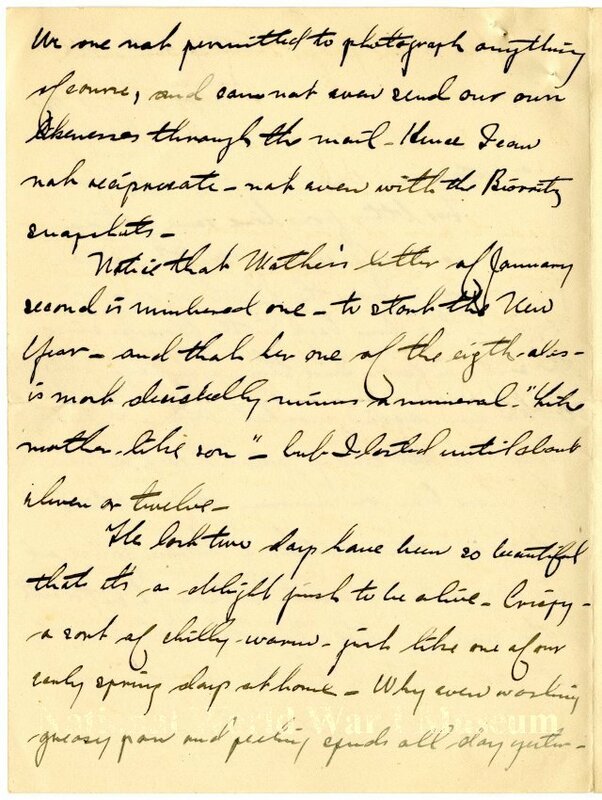 He continued, “I’m afraid my letters have been a bit gloomy and as I look back at my[?] experiences I now see no reason for my giving you the details I did. 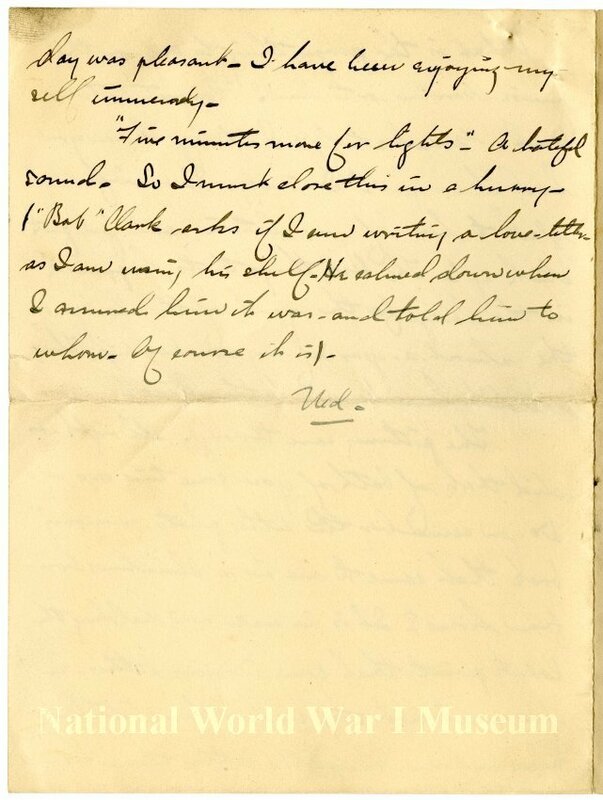 It was apart of my trouble that the effort to appear bright and cheery was beyond my strength.” Although Lamb expressed additional frustrations in the rest of the letter, he also assured his worried mother that time on leave had refreshed him. James Edward Henschel to Mother and Dad, France, February 11, 1918, 1-4, The National World War I Museum and Memorial, http://theworldwar.pastperfectonline.com/archive/253DCB62-5EFD-4C2F-A2F6-612852052030. Just as news from home and photographs assured soldiers and nurses of their families’ affection and maintained a sense of normalcy, the letters soldiers and nurses wrote home also tried to maintain this sense of normalcy. Oftentimes, censorship of letters meant that soldiers could write very little about the war, requiring that family members try “to read between the lines.” Some soldiers, however, were able to get information past the censors, thereby trying to maintain normal family relationships of openly sharing news. The sailor Conrad Ostroot described “antisubmarine tactics” in one of his letters, which “somehow got through military censors.” However, many soldiers, like Harry Ralston, who later married the lady he wrote to during the war, knew that those tasked with censoring the letters would first read the communications, and thus a degree of propriety guided Ralston’s sentiments. Even though soldiers had to be cautious because of censorship, some tried to maintain a sense of normalcy by focusing on matters of daily life. 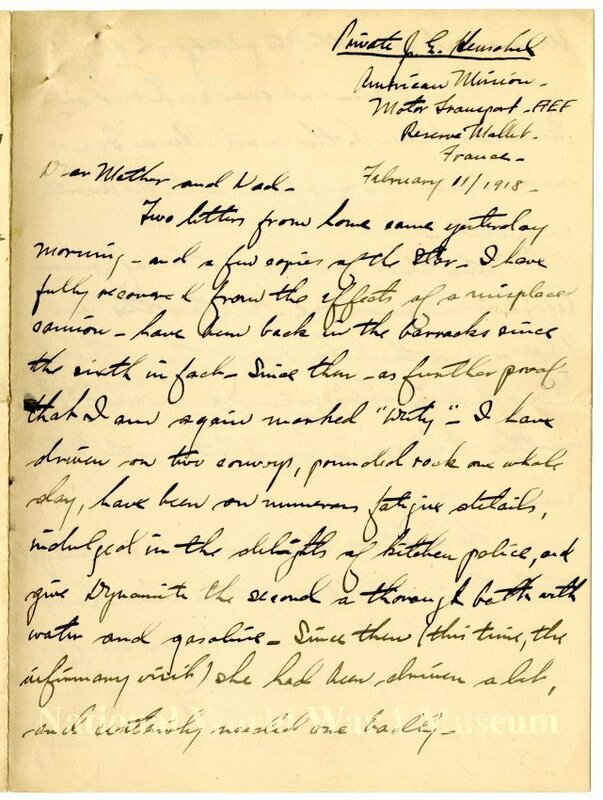 William Beans’s letter to his mother and wife, written while he was still stateside in December of 1917, is a perfect example of how soldiers frequently wrote about “normal” topics, like food. Upon the war’s conclusion, the precious letters that bridged the divide between the front lines and the home front became a way of preserving memories of the war. With many of theses letters now carefully preserved in collections, they are a rich resource for historians writing on the war. Memories were also preserved through postcards, which soldiers sometimes used instead of letters for a quicker means of communication. 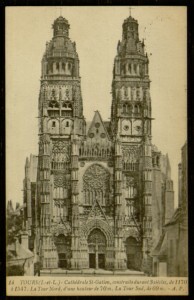 These postcards are valuable not only for the sentiments contained in them, but also for the photographs, which visually document the memories of wartime experiences. The Edward D. Forman Collection provides many examples of how wartime travel memoires were preserved through postcards. 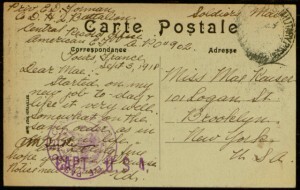 Edward D. Forman to Mae Kaiser, postcard, September 3, 1918, Collection of Postcards from Edward D. Forman, Digital Library, Villanova University, http://digital.library.villanova.edu/Item/vudl:334233. 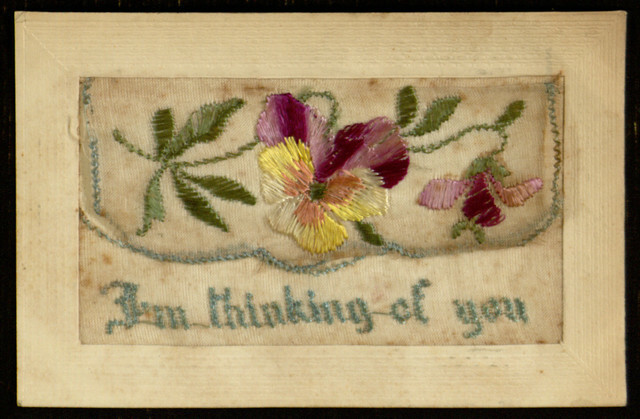 Now preserved in archives and, in some instances, digital collections, postcards and letters exchanged between the home front and the front lines demonstrate that soldiers, nurses, and their families wrote to each other for a sense of assurance and normalcy. These same documents are now a wealth of memories, which can bring the war to life for historians and descendants of the letters’ authors. J. Stuart Richards, ed., Pennsylvania Voices of the Great War: Letters, Stories and Oral Histories of World War I (Jefferson, NC: McFarland and Company, Inc., Publishers, 2002), 1. Judith S. Graham, ed., “Out Here At the Front”: The World War I Letters of Nora Saltonstall (Boston: Northeastern University Press, 2004), 3, 9-10. Anthony Dicello, France, March 25, 1918, in Pennsylvania Voices of the Great War, ed. Richards, 21. Charles Stanley Lamb to Mother, France, January 30, 1919, 1, Veterans History Project, http://memory.loc.gov/diglib/vhp/story/loc.natlib.afc2001001.01627/pageturner?ID=pm0075001. Megan Robertson, “Epistolary Memory: First World War Letters to British Columbia,” BC Studies no. 182 (Summer 2014): 131-132. Harry C. Williams, France, February 4, 1918, in Pennsylvania Voices of the Great War, ed. Richards, 16. John A. McGill to Mother, France, June 23, 1918, 2, Veterans History Project, http://memory.loc.gov/diglib/vhp/story/loc.natlib.afc2001001.84785/pageturner?ID=pm0004001&page=2. James Edward Henschel to Mother and Dad, France, February 11, 1918, 2, The National World War I Museum and Memorial, http://theworldwar.pastperfectonline.com/archive/253DCB62-5EFD-4C2F-A2F6-612852052030. Daniel E. Lee, Letters from a Sailor: America at War 1917-1918 (Lanham, MD: Lexington Books, 2011), 5. Robertson, “Epistolary Memory,” 125, 136. William James Bean to Wife and Mother, Brooklyn, New York, December 18, 1917, 1-3, Veterans History Project, http://memory.loc.gov/diglib/vhp/story/loc.natlib.afc2001001.24749/pageturner?ID=pm0005001. Bean, William James. Personal Correspondence. Veterans History Project, Library of Congress. http://memory.loc.gov/diglib/vhp/story/loc.natlib.afc2001001.24749/#vhp:personal. Henschel, James Edward. James Edward Henschel to Mother and Dad, France, February 11, 1918. The National World War I Museum and Memorial. http://theworldwar.pastperfectonline.com/archive/253DCB62-5EFD-4C2F-A2F6-612852052030. Lamb, Charles Stanley. Personal Correspondence. Veterans History Project, Library of Congress. http://memory.loc.gov/diglib/vhp/story/loc.natlib.afc2001001.01627/. McGill, John A. Personal Correspondence. Veterans History Project, Library of Congress. http://memory.loc.gov/diglib/vhp/story/loc.natlib.afc2001001.84785/. McGill, John A. Photo Album. Veterans History Project, Library of Congress. http://memory.loc.gov/diglib/vhp/story/loc.natlib.afc2001001.84785/album. Graham, Judith S., ed. 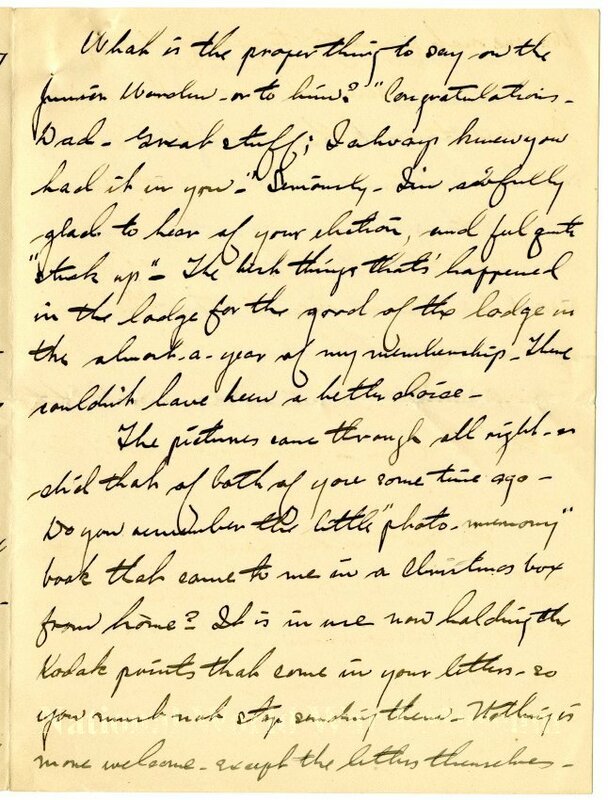 “Out Here At the Front:” The World War I Letters of Nora Saltonstall. Boston: Northeastern University Press, 2004. Harvey, William C., and Eric T. Harvey, eds. Letters From Verdun: Frontline Experiences of an American Volunteer in World War I France. Philadelphia: Casemate, 2009. Lee, Daniel E. Letters From a Sailor: America At War 1917-1918. Lanham, MD: Lexington Books, 2011. Richards, J. Stuart, ed. Pennsylvanian Voices of the Great War: Letters, Stories, and Oral Histories of World War I. Jefferson, N.C.: McFarland, 2002. Dempsey, Hugh A., ed. “Mary Warren’s Letters from the Home Front, 1916-1917.” Alberta History (Winter 2015): 2-15.